EFD - Mitgliedschaft im Verein der EurasierFreunde Deutschland e.V. We, the EurasierFreunde Deutschland e.V., want to inform you about the fascinating and eventful world of Eurasiers. Our young and dynamic Eurasier-Club consists of creative members with many ideas who want to express their enthusiasm for this natural breed. We love to share our leisure time with our Eurasiers, look for opportunities to exchange our knowledge about our dogs and want to share our personal experiences. We prefer a friendly and polite atmosphere. We see the Eurasier as an intelligent dog with special feeling, who thinks, can get bored and can express very variable desires. Communication between human and dog, or between dogs, will always be a topic of interest for us. 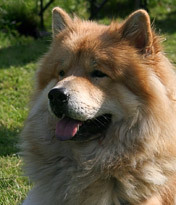 In the meantime, the Eurasier has its home in several European countries. International contacts are important, as each Eurasier owner – no matter from which country – is a small link in the Eurasierfriendship-chain which unites us all. In order for the club to grow, we welcome each new member. Overseas members pay a yearly rate of 39 Euros, which includes three yearly electronic issues of our informative club magazine, 'Eurasier-Journal'. Please find further information concerning membership in the document below. If you have questions concerning our club or a membership, please contact our Chairman/President.